This is the lowest component in a hierarchy and extends Unity’s existing audio source component functionality. An audio component cannot have any children components attached. 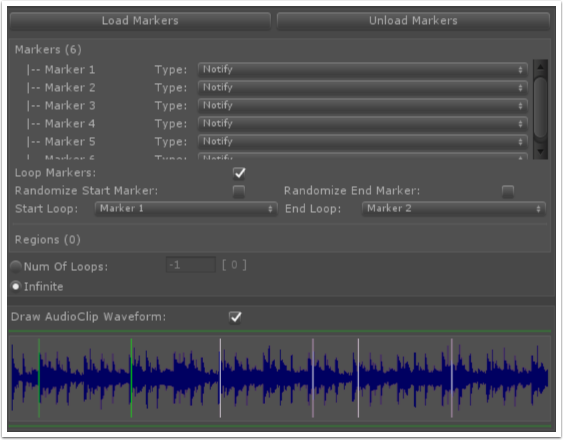 Read loop markers from wavfile. The Audio Componebnt can load Markers and Regions that are saved within the audio file that is set to play. NOTE: This is a manual process and its up to you to ensure that the markers are loaded/unloaded when a new audio file is selected. When loading Markers it is possible to set the type of notification the audio component will send to its parent. This is useful if the audio component is part of a Sequence or Switch hiearchy tconfigured to sync on a marker and that way instruct them when to advance. It is also possible to specify which the loop region using the markers and randomize the start or end marker from the list available. The randomization occurs everytime the sound has been looped. 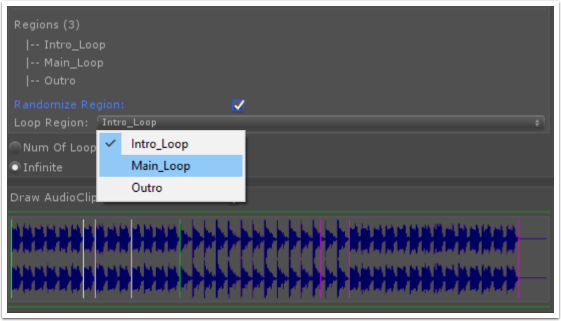 The audio component can also load Regions such as 'Sample Loops' and provide an option to set the active looop section. When the "Randomize Region" option is enabled the audio component will pick a new loop region in random everytime a loop is played. Audio component won’t be virtualized (stopped) according to distance from listener. Keeps playing when it’s parent game object is destroyed. The last know position of the game object is used. Pitch value of the component multiplied with/by its parent pitch. Audio clip is loaded into memory when its played for the first time. It will stay in memory until all instances have stopped playing. Loads the audio clip asynchronously without blocking the Unity thread. 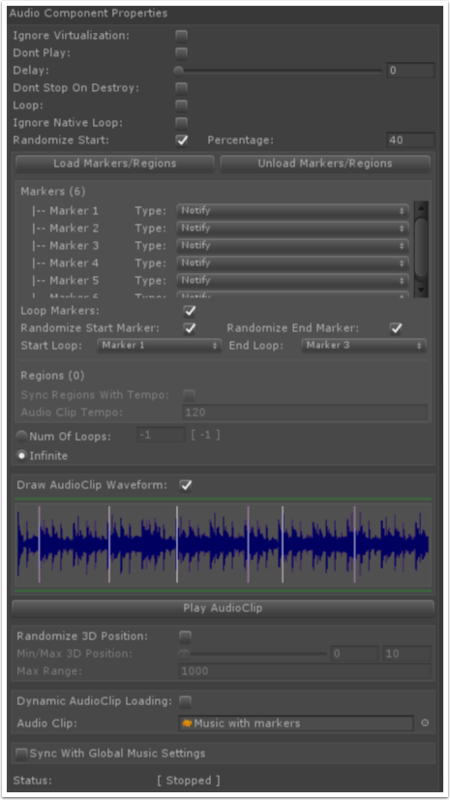 In Unity 5 AudioClip provides a Load In Background option so this option is not required. Audio component will start playing in sync with the music time settings selected. Note: This option is not available if the component is already in a hierarchy with the music sync option enabled.